There is no doubt that Philadelphia offers so much to visitors you would be hard pressed to find the time to do anything else. But if your visit to the city of brotherly love offers you a free day to do something else, you really need to do read this exploring outside Philadelphia guide and visit Bucks County. 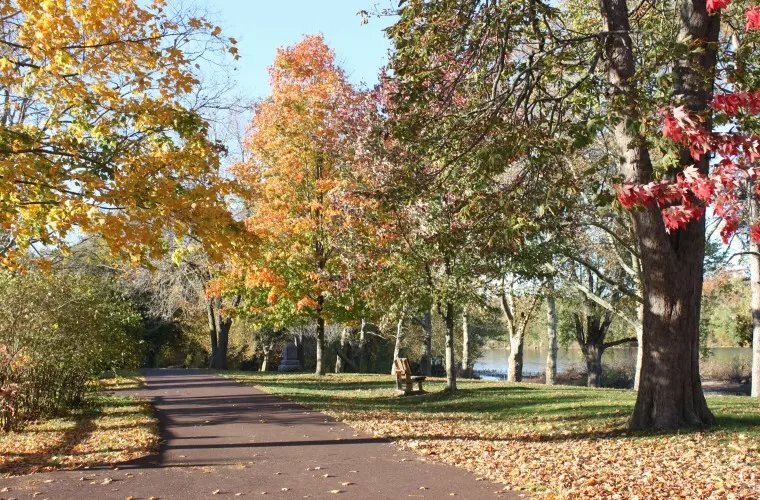 Bucks County is no more than an hour or so drive from Philadelphia, but its rolling hills and leafy towns are a world away from the big city. Out here is Delaware Valley country, a land not only shaped by the mighty Delaware River but more or less owes its very existence to it. From historic covered bridges, to wide open meadows and charming country towns, Bucks County offers a great day out from Philly, and I wanted to explore some of it. Not far from New Hope in Upper Black Eddy, the Ringing Rocks Park offers a fascinating and fun stroll through geological history. 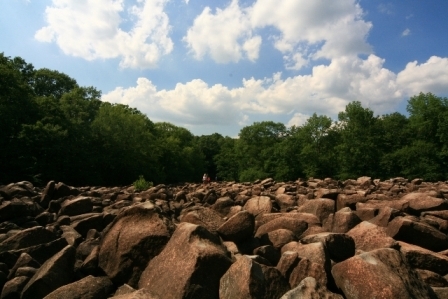 This 130 acre national park is home to huge fields of ancient boulders and rocks which “ring” when you tap them with a hammer. This is a bit of a mysterious phenomenon as to how or why the rocks ring and there are many theories but no definitive answer. The most popular is that deposits of iron coupled with internal stresses create the sonic capability, although not all the rocks actually ring! It’s a fun game to play with kids to try and pick which rocks will ring and which won’t! The park is also home to the county’s largest waterfall, so two good reasons to go and visit the Ringing Rocks Park. Perched right on the banks of the Delaware River, scenic New Hope is a perfect example of small town but affluent town USA. It is rumoured that George Washington stayed here for a while during the American War of Independence, which might be true as his army crossed the Delaware River to Trenton New Jersey, which was at Washington Crossing Park just 6 miles north of town. There is in fact an annual re-enactment every Christmas Day when 300 actors stage the crossing in front of thousands. New Hope was once the overnight halfway stopping point for people travelling between New York and Philadelphia. They would stay the night and then be ferried across the river to continue their journeys. These days, the town earns its keep from tourism, but don’t let that put you off as it is a very pretty place full of art galleries, antique shops and restaurants. Walking down Main Street you certainly get an authentic small town feel and the historic Bucks County Playhouse has almost legendary status as most of the Broadway shows went there to test out before opening. Grace Kelly, Robert Redford and Liza Minelli are just a few of the famous names who have walked the boards there. 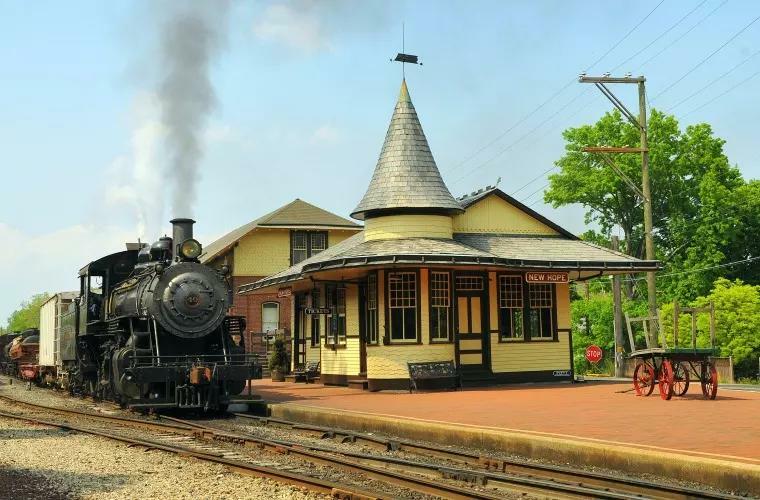 The town was also an important railroad stop for the New Hope and Ivy Land Railroad and today you can take a classic steam train ride through Bucks County’s rolling hills from the old station. 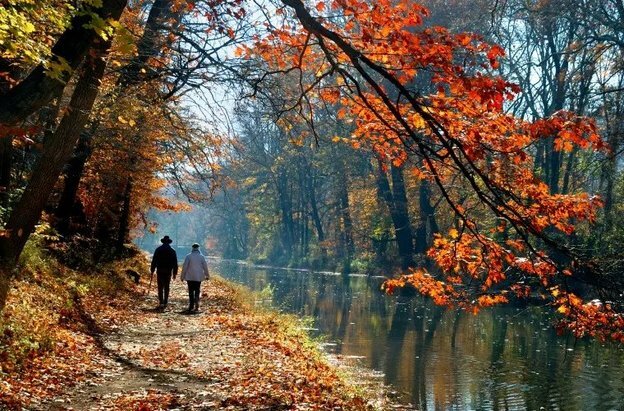 It’s also well worth taking a stroll along the towpath of the Delaware Canal State Park particularly in Fall when the leaves are a glorious yellow and rust. Feeling hungry, I stopped off for a late lunch at the Triumph Brewing Company , a lively spot with hand crafted beers, just in time for their Oktoberfest celebration. After a very tasty bratwurst and provolone sandwich with Portobello mushrooms, jalapenos and onions, it was time to head back to Philly. 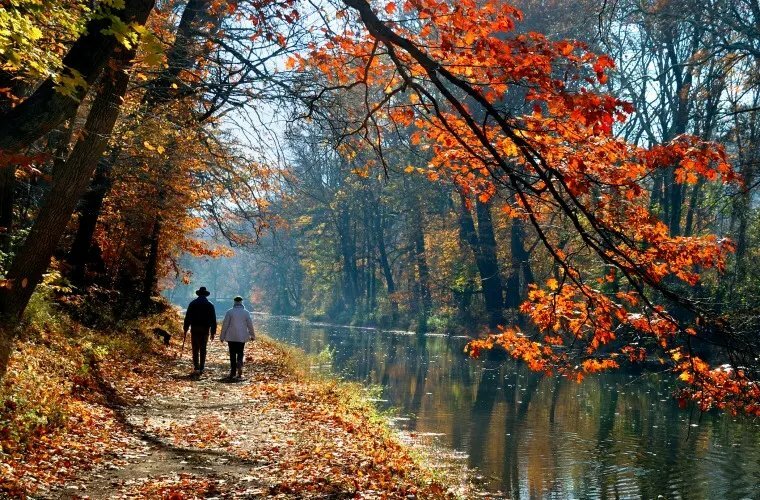 This exploring outside Philadelphia guide in Bucks County will bring an altogether different experience to your city break if you can fit it in. I would recommend you try and fit it in at all costs. 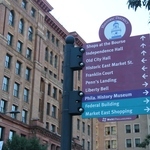 You can find detailed itineraries on what’s on and an exploring outside Philadelphia guide at the Visit Bucks County site. Tax free shopping in Philly is real retail therapy.